Sometimes a person out on the land on an empty stomach gets so cold that he starts to feel warm, then so hot that he starts taking off his parka [even in the middle of winter]... you must make sure that he keeps his clothes on and keeps moving around until you get him something to eat. The main hazard for sea kayakers in a cool climate is not hypothermia but cold shock and swimming failure. 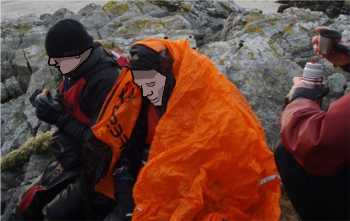 However hypothermia is still a real issue, just as it is for hikers and mountaineers. 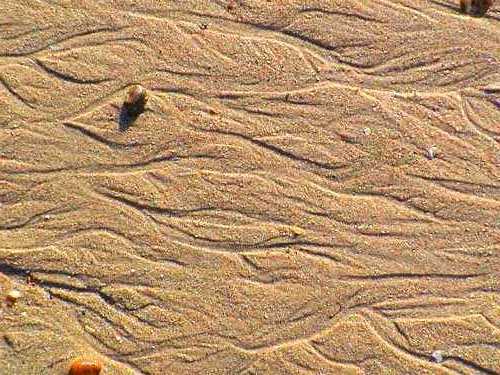 It can be caused by low sea temperatures or cold winds. The average year-round air temperature in the temperate regions where most sea kayaking takes place is about 61°F (16°C). feel. Sun, wind and atmospheric humidity make an enormous difference to how we feel. If there's bright sun and no wind you can sunbathe with an air temperature of 61°F (16°C). Or even 23°F (-5°C) on a lovely February day in the French Alps. But don't be misled. In early spring the water is still cold, and a bit of sunshine won't make any difference if you go for an accidental swim. According to windchill tables, an air temperature of 41°F combined with a wind of only 10 knots will cool you as fast as still air at 28°F. The effect is even more marked if you are wet. You can enjoy a kayak trip on a sunny, windless day in early Spring with no gloves despite a sea temperature of 47°F (8°C) and an air temperature of 35°F (2°C). Keep the temperatures the same but add a gray sky and a 15 knot wind and the picture is very different. Without gloves your fingers will be OK after twenty minutes when you have warmed up, but you may have to stop before then to stick them under your armpits. And that can hurt, when the blood starts flowing again. Probably most sea kayakers have been very cold at some time because of being wet, tired and hungry. You will experience low temperatures because of overcast skies, cold wind, cold spray and mist or fog. And when the sun goes down, the air temperature drops like a brick. If you're shivering, you're not enjoying yourself. If you have several inches of water in the bottom of your boat, and you are near a quiet beach, stop and empty it out. Put on some more clothing. If you have a snack, eat it and carry on. Clinical hypothermia, sometimes called exposure, is one step beyond being cold. It means a significant fall in core temperature. Normal core temperature is 98.6 degrees Fahrenheit (37°C). If your core temperature falls to 95°F (35°C) or below, that is the start of hypothermia. You feel cold, look cold and shiver uncontrollably. As you get colder, hypothermia affects people in different ways. Most people look very pale, perhaps with blue lips, but a few flush rosy pink. Some continue shivering, some stop. Some appear fully alert despite having a core temperature so low that most people would be unconscious. What they all have in common is that the cold starts shutting down their mental and physical functions one after the other. As this progresses you start to feel miserable, thought becomes too much effort, you lose motivation and start making mistakes. Out of apathy, you don't bother to put on a warm hat. You can't be bothered to keep your hands out of the water when you take a paddle stroke. You drop to the back of the group. Probably you will get sleepy, quiet and withdrawn, ignoring questions or giving short answers. If somebody persists in asking you if you're OK you may get irritable, asserting that there's nothing wrong with you. Increasingly apathetic and confused, you fail to take obvious precautions such as doing up a zipper. If you drop a piece of equipment, you let it float away. You may behave inappropriately, swearing aggressively at friends or taking off warm clothing. If your core temperature falls to 92°F (33°C) you may stop shivering. Your speech becomes slurred, your paddling and balance become erratic, if you capsize you probably come out of your kayak. In the water, you lose heat much more rapidly. You may be unable to climb back into your kayak following a deep-water rescue. Many people by this stage are unconscious or nearly so. As you enter deep hypothermia you stop shivering, you lose control over your limbs, your memory goes, your speech becomes incoherent, you hallucinate, you get sleepy. Eventually you lose consciousness and die. Children have a much higher ratio between surface area and volume than adults, and a child or a skinny teenager will lose heat much faster. (S)he may also have a cheap, ill-fitting wetsuit, no wetsuit boots, a leaking sprayskirt, a ripped anorak and five gallons of cold water washing around in the bottom of the kayak. The early stages of hypothermia can easily be mistaken for teenage grumpiness. Anybody leading inexperienced kayakers on a cold sea or a cold day must be constantly aware of the hazard, particularly if there are young people in the group. Hypothermia is a gradual process but it can kill a person who goes on until (s)he is exhausted. One classic mountain rescue tragedy is to find a party of hikers dead in the snow, wearing rucksacks with everything they needed to stop and warm up. Hypothermia and exhaustion go hand in hand. If the thinnest, weakest member of the group has entered the early stages of hypothermia, probably others will soon be dangerously cold. This may not be obvious. It is possible for a person with hypothermia to appear quite well even with a core temperature below 92°F (33°C). Then somebody who is borderline hypothermic capsizes, the others have to stop while a rescue is carried out, they get cold waiting, and you have a major situation as one person after another becomes a problem. If you are close to safety and nobody is exhausted, keep going. If not, give serious thought to stopping, getting everybody into a shelter and calling for help. • Make sure your boat and sprayskirt are both reasonably waterproof. • Remember it is always colder on the water than at home, or even on the beach. The sea in mid-summer may be 20 or even 30 degrees fahrenheit colder than the air, and it is windier on the water and that means windchill. • Choose suitable clothing, bearing in mind how you personally react to cold. In a cool climate, always take a waterproof jacket - even if it's so hot that tar sticks to your shoes and tumbleweed is blowing down the abandoned streets of the capital. You can't really kayak in clothing which will keep you warm indefinitely in cold water. You can wear clothing which will keep you functional when soaking wet in a strong wind, and which will keep you fully functional despite a 15-minute immersion. See Kayak Clothing. • Carry some extra clothing. See Hat, Scarf, Mitts. A group might also carry a spare one-size-fits-all sprayskirt as a spare, and an oversized paddle jacket which can be put on over the PFD of a kayaker who is getting very cold. • Eating is heating. Take a suitable snack. A big slice of cake and a mug of hot sweet coffee or hot chocolate soon restore morale. The warmth of the drink scarcely heats you up at all, but the sugar does. If you don't like candy you could take GORP (good old raisins and peanuts) and peanut butter has more calories than you would believe possible. You lose heat up to twenty-five times faster to cold water than cold air. Two minutes in cold water is a long time. If one of your group goes for an accidental swim with inadequate clothing, you can make an instant raft of your kayaks and get the casualty out of the water before you start emptying his or her flooded kayak. Fatigue can make you cold, but you will generally be a lot warmer paddling your kayak than shivering on a beach. If you are leading an advanced trip in cold weather, take some additional clothing and a survival bag or group shelter for lunchtime. If anybody gets hypothermia or is injured, you can put them inside until they can be evacuated. For a trip in very hostile conditions, consider also taking along a piece of foam sleeping pad. For more on shelter, see Group Equipment. If you are near a car, campground, pub or home it makes little difference whether a kayaker is cold and fed up or mildly hypothermic. Get them to put on a warm hat (very important), a scarf and mitts, give them a high-calorie snack to eat, encourage them to paddle but tow them if necessary, get them back and let them warm up gently. If you are still hours from warmth and safety, it is not a good idea to let any cold kayaker become exhausted by struggling on for too long at sea. Somebody who is merely cold now may become hypothermic after an hour's struggle with a headwind. But if you tow them a long way, they will get even colder because of inactivity. If you have enough equipment to make an effective shelter on a beach, consider getting them into a plastic survival bag, inside a sleeping bag, on a sleeping pad, inside a tent and get the other members of the group alongside them to share warmth. If the casualty is hypothermic, it becomes more important to treat them gently to avoid physical collapse. Unless they show obvious signs of hypothermia (or you happen to have a rectal thermometer and excellent diplomatic skills) you will not be able to tell if they are hypothermic or just cold and grumpy. To be on the safe side, don't give them alcohol, don't let them carry a kayak up a cliff path, don't make them run around to warm up. MANAGEMENT. There's nothing wrong with giving a sweet snack to a fully conscious hypothermia casualty, but don't give a full meal because if he subsequently loses consciousness he will vomit and it will be more difficulty to keep his airway open. It has been noted many times that a conscious, alert hypothermia casualty may unexpectedly lose consciousness after reaching a warm environment. The faster they re-warm, they more likely they are to suffer rewarming collapse, especially if they are active or standing up. The risk will be much reduced if they are lying down because this reduces the burden on their heart. If a conscious, alert casualty prefers to sit, you probably can't insist they lie down, but you can keep an eye on them while they are re-warming. If they get dizzy, faint or have difficulty with breathing and heart rate, lay them down in the First Aid recovery position. Particularly if they are going to re-warm themselves under a hot shower, tell them there is a real risk they may get dizzy and faint so a sitting position would be better. TRANSPORT. Try to keep the casualty lying down, and if for some reason you need them to be upright, stand them up gently. A lesson from the disastrous 1979 Fastnet yacht race is that if the casualty is to be evacuated by helicopter from a horizontal position or from in the water, they should be lifted with their body horizontal on a stretcher, not vertical in a rescue strop. Of course, that will be a decision for the helicopter crew. A deeply hypothermic casualty may die of heart failure if he suffers a long period of jolting over bad roads. PASSIVE RE-WARMING. You can't go wrong with gentle re-warming, whether the casualty has mild, moderate or severe hypothermia, and whether he became hypothermic quickly (from an accidental swim) or over many hours or days. Just put the casualty into an insulated environment such as a sleeping bag or bed, with a warm hat on his head, and he will eventually re-warm himself from the inside. He will generate heat by shivering. Particularly if a very cold casualty is not shivering, you can help by gently warming him. The classic recommendation is to get a warm friend into the sleeping bag or bed with him. Any casualty will re-warm a lot quicker in a warm bed in a centrally-heated building. If possible, place a hot water bottle or electric blanket on his stomach. ACTIVE RE-WARMING. If a hypothermia casualty gets anyplace near a hot bath or shower, he will want to get in there and wallow. Do you stop him? Most survival specialists are in favor of active rewarming as long as the casualty is fully conscious. It makes him feel better at once, and shortens the time during which the heart is under stress. However it may increase the risk of rewarming collapse, so keep an eye on him. For many reasons, you should never put an unconscious or semi-conscious casualty into a bath or shower. You can't be sure that his real problem is hypothermia. Even if it is, there is a risk that his breathing or heart may stop during or after warming. You will not be able to put him into the recovery position, you can't maintain his airway, you will have difficulty monitoring his breathing and heartbeat, and you will not be able to resuscitate him if they stop. Particularly if he became hypothermic over many hours or days, he is probably exhausted and dehydrated. His core temperature is probably below 86°F (30°C) and he has become a complex medical problem. Ideally, get him to hospital so he can warm up under medical supervision. If that is not possible, just get him into a bed or sleeping bag as described above. If you do actively re-warm a hypothermia casualty in a bath, get the water hot but not too hot. Test with your elbow. 104-106°F (40-41°C) is good for a hypothermia casualty. That is a little more than a baby's bath at up to 100°F (38°C) but safely below scalding heat at 111°F (44°C). Put the casualty into it so that body, arms and legs are all immersed. Their body is under enough stress already, so don't leave them in there so long that they overheat. If the casualty can't stay awake or his breathing or heartbeat become abnormal, drain the bath, get him out and put him to bed in the recovery position. Try to keep him horizontal between bath and bed. With the onset of hypothermia, the body reduces the amount of blood circulating through the limbs, in order to keep the core warm. Some recommend that if a casualty is re-warming in a hot bath his limbs should be left out of the water so as not to override this safety mechanism. In 2009 Dr Oakley commented that this "remains controversial, and current best practice is to rewarm with the limbs fully immersed. The biggest danger is allowing cold people to wander around, stand, sit, or most importantly to warm up standing in a hot shower - these can precipitate post-rescue collapse and rewarming collapse". Whitewater kayakers occasionally get trapped underwater in their kayaks after being swept under a tree (entrapment) or when the front end of their kayak gets jammed between boulders while they're going down a steep drop (vertical pin). A sea kayaker is rarely trapped underwater for longer than the 5 or 10 seconds it takes a big surf wave to let go of you. However, suddenly entering cold water can make you inhale if you are not properly dressed and acclimatized. See Cold Shock. If you go for an accidental swim in a rough sea, it is possible to drown while wearing a PFD, sprayskirt and drysuit. However your kayak will float and you can hold onto it, because you made sure it had bulkheads, additional flotation and deck rigging. Hold onto your kayak like a limpet. Don't let go, even for a moment. If you are being rescued by another kayaker, don't let go of his/her kayak, even for a moment. Empty or occupied, a kayak will float away faster than you can swim after it while wearing bulky protective clothing. Drowning is a combination of cardiac arrest and suffocation. Inhaling large amounts of water is likely to be fatal in less than two minutes. Inhaling quite small amounts of water can cause serious or fatal problems within minutes or hours. For example, pneumonia or death by suffocation. If you spend some time swimming in choppy water you can inhale dangerous amounts of water without realizing it. A casualty who may have had water enter their lungs should be under medical supervision in hospital even if they feel fine. Drowning is a risk with any watersport and it is worth doing a First Aid course to learn expired air resuscitation (EAR) and cardio-pulmonary resuscitation (CPR). "Drowned" casualties have sometimes been revived after a long time, especially if the water was cold. There have been many cases in which children were successfully resuscitated in hospital an hour after falling into very cold water. In 1999 Anna Bågenholm, a Swedish radiologist undergoing surgical training in Norway, had a back-country skiing accident and was successfully resuscitated after spending 80 minutes under water in a frozen stream. Her head was in an air pocket so she remained conscious for some time, but her heart stopped after 40 minutes. It took some time for mountain rescue teams to get her out from under the ice. She was then flown by helicopter to Tromsø hospital where she was successfully re-warmed by cardiac bypass (heating the blood outside the body) and her heart re-started four hours after she entered the water. At first she was paralyzed from the neck down. She had to spend two months in intensive care, but subsequently returned to both skiing and medicine. This incident led to the widespread use of deep-cooling of patients before they undergo some forms of major surgery. They are cooled to 91°F, the surgeons have longer to complete the surgery, and then the patient is re-warmed and revived. Expired air resuscitation, obviously, is useful if the victim is not breathing. Start EAR while another member of the group calls the emergency services. If it doesn't work at once, don't give up too soon. The victim's heart may be beating even if you can't detect a pulse. EAR may well be keeping enough oxygen in his blood to keep him alive. The value of external cardiac compression (ECC) is less clear. It is useful if the victim's heart has stopped, but is unlikely to re-start the heart unless applied within a minute or so of cardiac arrest. Generally it is just a way of keeping the blood circulating going until the heart can be re-started with a defibrillator, which would usually have to be done within two hours of the incident. In Ms Bågenholm's case, EAR and ECC were carried on for three hours after cardiac arrest, so that oxyen was still reaching her brain, and she was successfully revived after that. There is some disagreement amongst physicians but best practice is probably not to attempt ECC on a casualty who, if he is in fact alive following immersion in cold water, would be severely hypothermic. The casualty may well have a very faint or slow heartbeat, which will become detectable some hours after the start of re-warming. ECC could stop his heart. 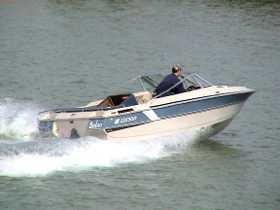 On busier waterways, getting run down by a careless power-boater is a real hazard. And don't even get us started on the subject of jet skis and their owners. About half the time you see dinghy sailors they are racing intently round a fixed triangular course marked by buoys (sailing dinghy + husband + wife + race = divorce). The upwind performance of sailboarders and kite surfers is not great, and they want to land back near their vehicles so they usually sail out from the beach at a right-angle to the wind. If they're in a group they are probably going backwards and forwards in narrow parallel lanes, like swimmers doing lengths in a pool. You can't rely on hearing an approaching boat. Sailboats are silent, powerboats emit most of their noise at the rear so on a windy day you won't hear them coming. And it's usually windy out on the water. Commercial ferries have a schedule to keep so they start without warning and change course for nobody. Chain ferries across narrow channels can't change course because they are literally attached to an underwater cable or chain stretched across the channel. When a chart warns of high-speed vessels it really means it. There are 35-40 knot waterjet-powered supercat ferries in most parts of the world, and hydrofoils and hovercraft run scheduled services at 50 knots in relatively sheltered waters, for example in the Bahamas. Warships occasionally accelerate like a greyhound on steroids, just for the fun of it. When a large vessel travels at high speed near the coast its wake is seldom noticeable at sea but may create major waves at the coast. Container ships and tankers may be doing 20 knots. Many of them have a draught of 65 feet and a few very large gas carriers extend more than 80 feet down underwater. Large ships are often unable to change course or stop. See more below, and click here to see a real-time map with the course and speed of all ships and boats fitted with AIS, worldwide. The rules are simple for kayakers - keep looking over your shoulder for approaching boats, stay out of everybody's way, and don't expect anybody to see you or try to avoid you. If you may be on a collision course with a boat or ship, don't confuse the other vessel. Either stop, so the other vessel can see you have stopped, or make a single conspicuous change of course and stick to that course until the other vessel has passed. If you need to cross a busy channel, treat it like a busy highway and cross it at right angles. Larger boats and ships have to stay in deep water, which often means following a single channel marked by navigation buoys. A kayaker will be safer in the shallow water outside the channel. See Navigation Marks and Night Navigation Marks. The helmsman of a large ship may not know you're there. By the time a kayak is close enough to see, the helmsman's view from the ship's bridge is blocked by his own bow. The Queen's Harbour Master - Clyde produced this graphic to illustrate the point that "restricted view from the bridge of a large ship means small vessels may not be visible when within a third of a mile." If a yacht with 100 square feet of brilliant white sail is invisible to a large ship, what chance is there of it seeing a kayak? Kayaks are unlikely to appear on radar. In any case, a large ship needs a long distance, sometimes as much as a mile, to stop or turn. When a fishing boat has its trawl down, it may not be able to change course without capsizing. An inexperienced kayaker may not realize that it is possible to get run over if you try to cross just up-tide of an anchored ship. If a ship is moored or anchored in water with a 3 knot current, for a kayaker it is exactly if the ship is travelling at 3 knots. The International Regulations for Preventing Collision at Sea (COLREGS) are online in various places including wikipedia and the Admiralty Law Guide. They say that motor-driven vessels must give way to sail. Two motor-driven vessels going in opposite directions must pass "port to port", in other words leaving the other vessel on the left. Where two sailing vessels are on a collision course, then if they have the wind on different sides the one on port tack (the one with the wind coming from the port side) must give way. 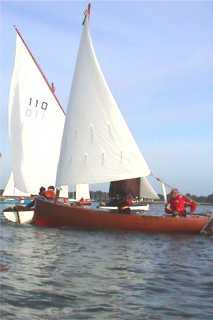 If they both have the wind on the same side, the windward vessel must give way. In the photo, the shaven-headed skipper of the brown sailing boat decided to turn 90 degrees to port and sail across the path of a flotilla of other boats. Ten seconds later he rammed the back of the white boat, damaging it. Who's to blame? Sailboats going upwind have to make sudden 90 degree course changes, and they usually leave this to the last possible moment as they get near the edge of the deep water channel. Run aground at speed or scare the living daylights out of a kayaker? Hmm, tough call. Plenty of sea kayakers get serious long-term back problems, mainly as a result of lifting and carrying their kayaks. It can happen at any age but can be avoided by good manual handling technique, in particular getting somebody to help by carrying one end of your kayak. See Carrying Your Kayak. If you overdo it on a kayak trip, you are going to get aches and pains in your shoulders and possibly your wrists and elbows, but if you get them on Sunday they should be better by Thursday. A few unusually vulnerable people get discomfort in their arms and hands which lasts for weeks, months or years. If you are vulnerable you may develop a significant problem if you kayak five days a week as a job; or you use your kayak to tow a heavy load a long way; or you spend many hours fighting to make progress in strong wind and waves; or you do a long expedition with a loaded kayak. Especially if you suddenly do these things after months of not kayaking at all. There are many wrist and elbow diseases recognised by physicians, including tenosynovitis (teno); carpal tunnel syndrome; epicondylitis (tennis elbow or golfer's elbow); de Quervain's syndrome (stenosing tenosynovitis or washerwoman's thumb); peritendonitis crepitans; tendonitis (also known as tendinitis); cubital tunnel syndrome (CUTS), radial tunnel syndrome and ulnar tunnel syndrome. Shoulder diseases include capsulitis or frozen shoulder, welder's shoulder, bursitis, infraspinatus tendinitis, bicipital tendinitis, and ruptures or lesions of part of the rotator cuff. Most of these are usually caused not by but by direct impact, or by indirect impact such as using your arms to save you when you fall over. Some of them just happen. Many women in their 30s and 40s get carpal tunnel syndrome for no obvious reason. You may have seen media coverage of "repetitive strain injury" (RSI) and "work related upper limb disorder" (WRULD) in which overuse syndromes are said to be invented by patients who want compensation, or to be all in the mind. With that background, many family physicians are reluctant to say there is anything wrong with you unless the injured joint is visibly swollen, or feels lumpy, or makes a crunching noise when you move it. If you have reached that point you are really in trouble. Cortico-steroid injections into the joint may help. If not, you may have to give up kayaking for good. To avoid all that, try treating yourself when you first experience a definite problem. Reduce the amount of kayaking you do. If that doesn't help, maybe stop kayaking completely for six weeks and re-start gently. If you use a paddle with 90-degree offset, one of your wrists has to bend backwards a long way with every alternate paddle stroke and that wrist is more vulnerable than it needs to be. Try a 65 degree or 45 degree offset or use a Greenland paddle. They're good. Arnica ointment seems to work for some people, others swear by applying local heat in the evenings with an infrared lamp or a miniature electric blanket made for people with arthritis. Some take non-steroidal anti-inflammatory medication. In other words, ordinary painkillers. Be aware, long term use of oral NSAIDs causes stomach problems. However many physicians feel there is often a psychological component to overuse syndromes, which in practical terms means that if you focus too much on your problem you can actually make it worse. In particular it is seldom a good idea to immobilize any joint, so don't use a bandage or sling unless your physician insists, and do keep using your hands and arms for the usual everyday activities. If you have a wrist problem, it may be worth giving up anything which hyper-flexes your wrists, such as doing press-ups with the palms of your hands flat on the floor. Even if you kayak for a living, the only real answer may be to STOP KAYAKING for a few months until your joints feel good again. We would guess that 2% of advanced whitewater kayakers have dislocated a shoulder. 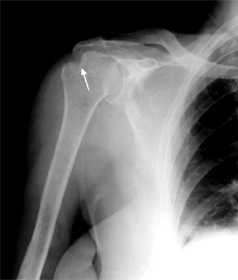 Dislocation is a real hazard for a kayaker who loves whitewater and big surf, if his/ her shoulder has a small but common design problem. It is rare for a sea kayaker to dislocate a shoulder. It can happen if you over-reach while doing a high recovery support stroke, or you let your hands get above your head while doing a high brace in a really big breaking wave on a surf beach. For "how not to do it" pictures see The Safety Box. A dislocated shoulder is as painful and disabling as a broken arm. Most of the pain stops when the shoulder is put back into its socket but the casualty will seldom want to go kayaking for another two weeks. If your friend's shoulder comes out of its socket in some remote part of the world, should you try to put it back in at once, or should you just secure it so it cannot move around and take him to hospital? Some say go to hospital every time, because a physician will X-ray the shoulder before and after, in case any blood vessels get trapped or there is any fracture as on this X-ray. All too often, the physician just uses brute force to put it back in and hands out some pain-killers. No X-ray before, often no X-ray afterwards. The advantages of putting it back in at once are that the pain stops at once; the casualty does not get hypothermia while waiting for an ambulance or helicopter; the rest of the group can calmly tow him back to base rather than trying to hurry to a road to meet an ambulance; the shoulder does not have time to swell up so it is easier to re-locate the joint; and statistics show that the functional outcome is likely to be better in the long term. A shoulder that has once dislocated will have a tendency to do so again in similar situations, but is then much easier to put back into its socket and the casualty can often go kayaking again a few days later. Exploring caves and the base of cliffs is one of the great pleasures of sea kayaking. 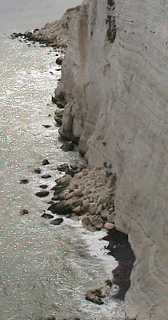 Rock and ice cliffs are subject to continuous erosion. Both are undercut by the sea and eaten away by rain. Cliffs are shattered by freeze-thaw in cool climates, differential expansion in hot climates, and water in wet climates. Stones fall into the sea; small rocks and large boulders land on the beach; sometimes entire sections of cliff break off. With steep cliffs of softer rocks such as volcanic material as in Hawaii and the Canaries, or chalk as in the White Cliffs of Dover, you definitely take your chances. The Dover cliffs are retreating at an average of 1 to 2 inches a year but large cliff falls sometimes take off a vertical slab three feet thick. Steep cliffs containing a layer of very soft rock such as clay, mudstone and some shales and sandstones are usually dangerously unstable, especially after heavy rain. There are no strict rules. The 700 foot high Cliffs of Moher (Ireland) are pretty stable despite being made of layers of shale and sandstone but the soft sandstones of Albufeira (Portugal) occasionally drop sections onto sunbathers, and the Lyme Regis (England) cliffs of Jurassic clay under layers of greensand and chalk are just lethal after heavy rain, with dangerous rock-falls every few minutes. If you can see cones of rubble standing on the beach and extending up the face of the cliff, or hear the occasional pattering of stonefall, stay well clear of the base. A whiteness moved in the whiteness of the fog with a breath like the breath of the grave, and there was a roaring, a plunging and a spouting. It was his first introduction to the dread summer berg of the Banks. Greenlanders tend to keep their boats a very respectful distance away from ice cliffs and large bergs. 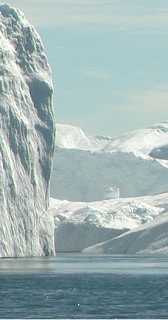 Ice cliffs with open water at the base are always unstable. This may not be apparent until brick-sized fragments start to whizz past you. Photo by Richard Best. Very large waves are created when sections of ice cliff fall into the sea. If a mass of ice lands in deep water, it may seem to make no more than a big splash. However there are ripples radiating outwards. When they enter shallow water, for example on the beach half a mile from the glacier where you are eating your lunch, they may turn into breaking waves 10 feet high which can pick up truck-sized blocks of ice resting on the sand and throw them around like dice. Ice bergs are very tempting because they're often sublime colors and extraordinary shapes. Tall bergs regularly capsize as the sea gnaws away at the underside and makes them top-heavy. Obviously, tall thin bergs are particularly likely to capsize but a very wide berg can sometimes roll over.